Whether traditional tube style, or basin style, all hummingbird feeders have one thing in common…very tiny feeding ports! These tiny ports tend to build up a “black mold” during summer’s extreme temperatures. Rinsing hummingbird feeders with hot water does not always remove this gunk. Sugar water gets very nasty, even fermenting within just a few days. 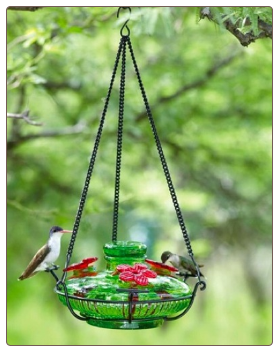 Hummingbirds will rarely re-visit a feeder that has bad nectar. 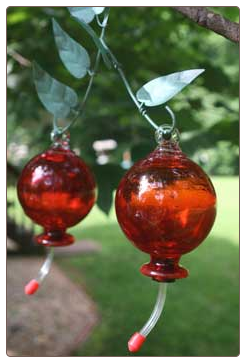 To keep your little sprites happy and keep them around for the season, squeaky clean hummingbird feeders and fresh nectar are essential. So just how do you clean those itty-bitty feeding ports? The secret weapon is an old mascara brush! Before tossing your next (or grab your wife’s) mascara, save the brush and run it through the dishwasher to remove all the makeup and residue. These make the perfect cleaning brush for feeder ports on any tube style hummingbird feeders, and basin styles as well. By the way, if you’re still buying commercial nectar… it’s time to try and make your own. The recipe is so very simple and it takes less than five minutes. Our hummingbirds prefer the plain sugar water, and once we started feeding it, there was a dramatic increase in visitors who stuck around the entire season. So here’s the recipe to the stuff to fill your hummingbird feeders with: one cup plain table sugar to four cups water. That’s it! Nothing else in the mixture as it will harm or kill hummingbirds. No need to boil the water either, microorganisms are spread through the bird’s bills… not the feeders or nectar. We do boil one cup of water, simply to dissolve the sugar quicker and more effectively. You can then store unused nectar in the fridge for up to two weeks. So this season, save the mascara brush and try your own nectar! 1. Beware of fireworks. Fireworks are no blast for some pets, with many cats and dogs becoming easily frightened by the deafening roar of rockets bursting in air. The best option is to leave your cat or dog indoors (not leashed in the yard) during the holiday weekend (July 1-4) in a safe, secure, escape-proof room of the house with comfy bed, food and water. Also consider leaving a TV or radio on to drown out the sound of the fireworks and to provide familiar noises while you’re out. 2. Confirm your pet’s collar and I.D. information. Dogs and other pets can become easily frightened by loud celebrations on the 4th of July. Make sure your pet is wearing a properly fitted collar with correct identification and tags just in case he or she becomes scared and runs away from home. Micro-chipping also is a great precaution to make it easier for your pet to be returned home safely and promptly. 3. Be careful with 4th of July decorations. Remember that your pet may easily mistake your red, white and blue decorations and glow sticks as chew toys; cats can even become tangled in streamers and ribbon. Make sure to pet-proof your home and keep fun decorations out of a paw’s reach. 4.. Call your vet. If you think your pet needs to be sedated or tranquilized to handle the fireworks noise and celebrations, contact your animal care provider. 5. Watch the alcohol. Alcoholic beverages have the potential to poison pets; never leave your beverage unattended. If alcohol is ingested, your pet could become very intoxicated and weak, severely depressed, and could go into a coma or worse. 6. No picnic table and grill scraps. Always be aware of what friends and family are sneaking to your dog under the table. While tempting on such a festive occasion, human food (bones, onions, avocado, grapes and raisins) should be off limits at all times to your dog. Some human food may be toxic or dangerous if ingested and cause stomach upset. 7. Never leave animals tethered or chained outside. Pets can injure or hang themselves if they jump around or leap over a fence while trying to run from the noises. Cats should stay indoors. 8. Never leave pets in unattended parked car. Partially opened windows on hot days do not provide sufficient airflow and also can put your pet in jeopardy of being stolen. 9. Stay in the shade. Like humans, dogs and other pets can suffer from heatstroke. Keep your pets in shaded areas on very hot and warm days. 10. Stay hydrated! Dehydration is the #1 concern and danger during those long summer heat waves. Make sure you have a generous amount of fresh water on hand to quench your dog’s thirst. “We all love the 4th of July and our country’s independence celebrations, but it can be a rough time for cats, dogs and other pets,” noted SEAACA Executive Director, Dan Morrison. “With a few simply precautions, we can make it safe for every animal and celebrate without worry,” he added. SEAACA (Southeast Area Animal Control Authority) provides animal care and control services for 14 cities in southeast Los Angeles County and northern Orange County, including Bell Gardens, Bellflower, Buena Park, Downey, Lakewood, La Palma, Montebello, Norwalk, Paramount, Pico Rivera, Santa Fe Springs, South El Monte, South Gate and Vernon. SEAACA’s Animal Care Center located in Downey reunites pet owners with lost pets and assists new pet owners with pet adoptions. SEAACA’s Animal Wellness Clinic, also located in Downey, spays and neuters all adoption animals plus provides vaccinations and micro-chipping to the general public. For more information about SEAACA, please visit www.seaaca.org. Is it possible to have too many bluebird houses? The answer would be yes and no, depending on several factors and just how “into” bluebirds you’re willing to get. I recently joined a forum for Bluebird Monitors as I’ve seen some pretty bizarre happenings with bluebirds this season. In the past, Eastern Bluebirds have over-wintered in our North Georgia Yard, and have gone on to nest in various bluebird houses, raising several successful broods. It’s awesome to watch older siblings help raise the fledgelings too. And mom and dad will work as a pair for about 30 days to raise their brood. The first five eggs all hatched, all fledged… off to a good start, right? Not really 🙁 The male disappeared about 3 days before these babies fledged, so mom was on her own. It wasn’t long before these babies learned to feed themselves at the mealworm feeder. Granted, only three of them made it thus far, but it looked promising. I then noticed a strange lump, almost a protrusion on one of these babies, which was the reason for joining the bluebird forum. After posting the question, I’d received a detailed answer saying this was likely a broken air sac, which happens frequently to fledgeling as they can’t really tell yet what’s solid or open. It could either absorb itself, or turn infectious. I watched daily, this group of three siblings who stuck together at feeding times. It was the female with injury and I so hoped she remain okay. And she did for a while, until the turf wars began. Enter a new male Eastern Bluebird: he had it in for these fledgelings as they were not his brood. Relentlessly he’d chase them from feeder to feeder, dive-bombing and harassing them constantly. It was the most difficult thing to watch. The new male was trying to attract one of the two adult females… and with all his might at that. One day there were no fledgelings, two days and no fledgelings, by day three I’d given up. The male had either driven them from the area, or killed them. I’d never seen Bluebirds engage in such behavior, and it saddened me. About one week later, I learned of the new nest and the babies who had hatched. Never actually monitoring this bluebird house, I’d watch the female cram as many worms in her mouth as she could and fly to the box, so I knew she was feeding hatchlings. This bluebird house sits very high up, so again, it was never monitored. The ot her day I saw both parent bring three fledgeling to the mealworm feeder, and had better hopes for a successful brood. Typically Bluebird Houses should be about 100 feet apart. With an acre of land, we have several different kinds of houses for them. Other cavity nesters also use bluebird houses and this is where some extreme bird wars are created. House Sparrows are enemy number one, destructive and aggressive, they’ll chuck Bluebird eggs from the houses, kill nestlings, and even adult Bluebirds. House Wrens will do the same, wreaking havoc on Bluebirds. Tree Swallows will also compete for Bluebird Houses, and sometimes adding a second house 10-15 feet apart helps eliminate competition. After reading the many posts from the Bluebirds Forum, I’ve learned that most species are quite territorial during nesting season, aggressive and downright mean. Predator guards help some, and devices called “sparrow spookers” may keep these non-native demons at bay, but I guess it’s just survival of the fittest, kinda sad that mother nature can be so tough. Buyer beware…. 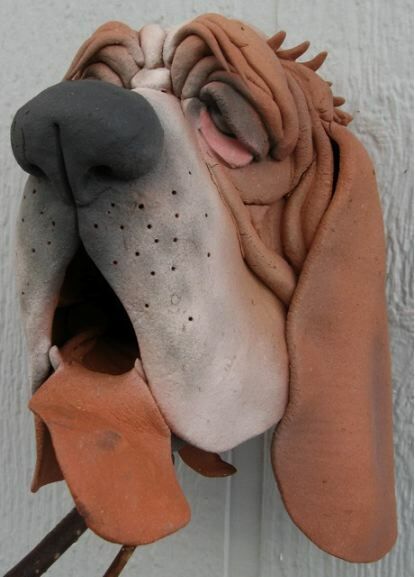 not all decorative birdhouses are meant for feathered friends! Just because they’re made from wood and have an entrance hole, does not mean they’re really suited for wild birds. 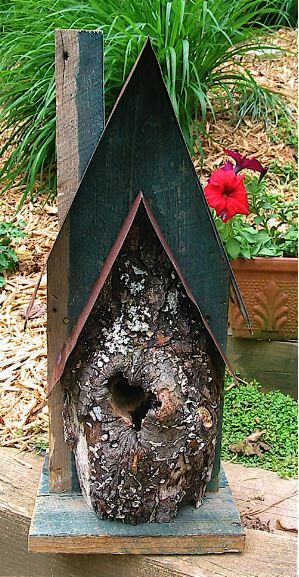 Many of these wooden, cute decorative birdhouses lack clean-outs and proper ventilation for tiny nestlings. As if sweltering summer temperatures aren’t bad enough, it’s always a few degrees warmer inside a birdhouse, and this can mean death for some nestlings. This is one good reason not place new birdhouses in direct sun. Another factor is year-round weather. Will this birdhouse hold up to the elements? 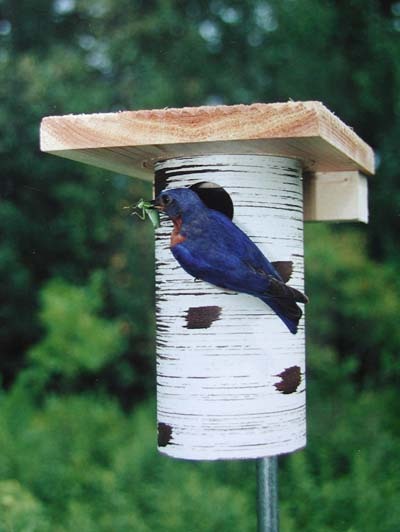 It’s always best to leave birdhouses out year-round as many birds will use them to roost. Protection and shelter from the elements and from predators are the reasons to leave decorative bird houses out year-round. 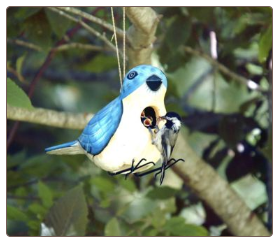 Plus if they’re really cool birdhouses like these, you’d certainly want them for the added aesthetic to your yard. This Eastern Bluebird Look-Alike hosts a family of Black Capped Chickadees. The house has a trap door clean-out on the bird’s belly, and the entrance is proportionally correct for these smaller songbirds. This size birdhouse with a two-inch entrance isn’t likely to entice any prospects for nesting. And even if it does, they’re likely not safe from predators. 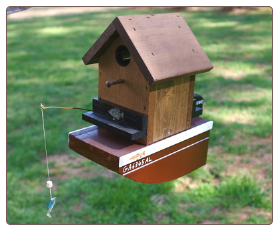 The Boathouse Birdhouse also features a side wall with screws for clean-out, and a slightly larger entrance offers medium sized songbirds a great nesting spot. When considering decorative birdhouses, be sure they are functional and proportionally sized for the birds you’d like to entice. As always, a fresh water source is the single, most effective way to attract more birds. Those who are not cavity-dwellers, or birds who never visit a feeder are likely to check out a bird bath with fresh water in it. Water has got to be the most effective way to attract more birds… and wildlife in general. If you think outside the box with bird baths, there’s really so much more out there than just your standard pedestals or hanging models. Bird baths come in all shapes and sizes, and ground bird baths will attract way more than just birds. Here in the Southeast we’re experiencing the usual summer drought, with unusually high temperatures. Mid-June actually feels like August… it’s just brutal 🙁 I feel for anyone in the landscaping business or nurseries as their season was cut extremely short this year. Most pastures are looking like the outback-brown and crunchy. Our yard features two leaf misters that emit a gentle spray for most of the day. This butterfly puddler is set below one of the misters and allows water to collect and “puddle”. All plants grow full and lush around the misters too. Seems this little guy has found cooling refuge from the extreme heat and beating sun. 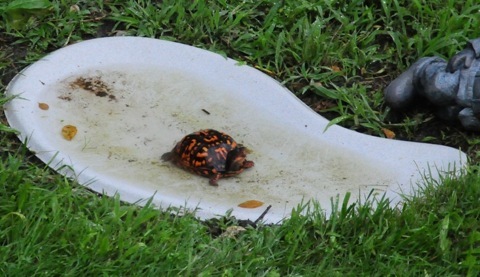 Butterflies, hummingbirds, frogs, lizards and so many others will frequent these kinds of shallow ground baths. Birds tend to bathe naturally at ground level, so it’s a most popular spot for them too. When considering bird baths for your yard… next time think outside the box! Could we be facing a future without some of our most beloved feathered friends? meadows to farmland, urban sprawl, pollution, logging, and other factors. Audubon has identified more than 20 birds, once abundant, whose numbers are now plummeting. Our birds are sounding a warning; for the threats to these birds are threats to the ecosystems upon which all life depends, including our own. The challenges are many, and so the solutions will be many as well. But all solutions begin with knowledge. So we ask you to support the National Audubon Society and share this with a friend or two. Audubon’s unprecedented analysis of forty years of citizen-science bird population data from our own Christmas Bird Count plus the Breeding Bird Survey reveals alarming declines for many of our most common and beloved birds. The findings point to growing impact from the many environmental challenges our birds face, from habitat loss from development, deforestration, and conversion of land to agriculture, to climate change. Only citizen action can make a difference for the birds and the state of our future. The wide variety of birds affected is reason for concern. Populations of meadowlarks and other grassland birds are diving because of suburban sprawl, industrial development, and the intensification of farming over the past 50 years. Greater Scaup and other tundra-breeding birds are succumbing to dramatic changes to their breeding habitat as the permafrost melts earlier and more temperate predators move north in a likely response to global warming. Boreal forest birds like the Boreal Chickadee face deforestation from increased insect outbreaks and fire, as well as excessive logging, drilling, and mining. One thing these common species all share is the grim potential to become uncommon – unless we all take action to protect them and their habitat. Browse the species and learn what you can do to help. Some feeders are more popular than others, as are some of the bird treats offered to feathered friends. Outrage and feeding frenzies can be expected from some species, while others like Goldfinches, would rather give up & fly away than fight for a spot at at wild bird feeders. 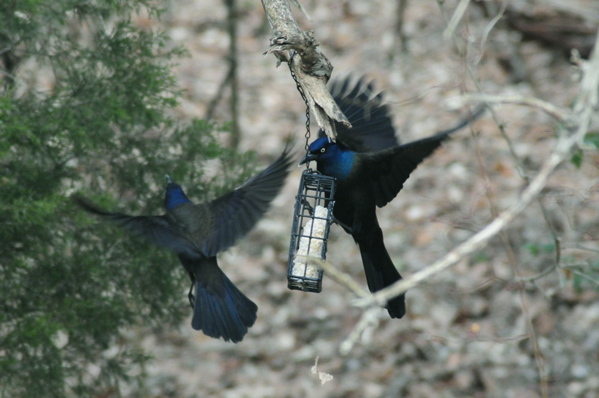 These grackles are doing battle over tempting suet at this feeder. A great photo, their iridescent color is superb. Certainly not one of my favorite birds, but again a cool photo. They are so darn smart too! If I sit outside on the deck, the Grackles will circle the perimeter of the yard, hide in the canopy and just wait to swoop down on feeders…and at my split-second departure. Upon my return, just as soon as the screen door opens… off they go. They actually sit and watch me, waiting for me to leave so they can raid the wild bird feeders. Their favorites have got to be the live meal worms (meant for the Bluebirds), Suet and Woodpecker Mix. I’ll admit it is quite the smorgasboard in our yard, and getting the good birds will inevitably attract some not-so-desirable ones too. Speaking of wild bird feeders, have you ever seen Hilda? She’s a cool stoneware feeder that the birds just love. 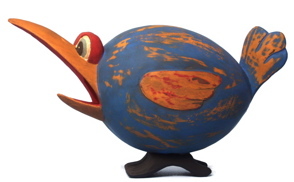 Filled with sunflower seed, she attracts all kinds, and the innovative design deters larger birds with its small perch. In several fun colors, she’s definitely a very wild bird feeder! · Close to home (and market). Produce from urban farms and gardens does not need to travel as far as produce grown in rural areas to reach the dining table, which helps to reduce production costs, post-harvest waste, and greenhouse gas emissions. This is also helpful in situations when supply chains from rural areas have been interrupted and cities are unable to receive food imports. · Empowering women and building communities. In Kibera, the largest slum in Nairobi, Kenya, Urban Harvest has helped women build “vertical farms” simply by using sacks of soil in which to grow vegetables. Using these gardening activities, the women share business ideas and technical know-how, empowering each other. The community gardens also act as a forum where community members can exchange ideas and discuss community issues and problems. · Improving urban environments. Faced with limited resources, urban farmers are adept at utilizing urban waste streams to strengthen their soil and grow their crops. Garbage is used as compost or fodder for livestock, and nutrient-rich waste water is used for irrigation. By re-using these waste products, urban farms help to reduce the amount of refuse clogging landfills as well as the amount of water used in cities. Community gardens also provide an aesthetically pleasing space and help improve the air quality in urban areas. State of the World 2011 is accompanied by informational materials including briefing documents, summaries, an innovations database, videos, and podcasts, all available at www.NourishingthePlanet.org. The project’s findings are being disseminated to a wide range of agricultural stakeholders, including government ministries, agricultural policymakers, and farmer and community networks, as well as the increasingly influential nongovernmental environmental and development communities. Worldwatch is an independent research organization based in Washington, D.C. that works on energy, resource, and environmental issues. The Institute’s State of the World report is published annually in more than 20 languages. For more information, visit www.worldwatch.org. Some birds that is! Of the many wood birdhouses situated in our yard, the first brood of bluebirds hatched and fledged from this PVC birdhouse instead. 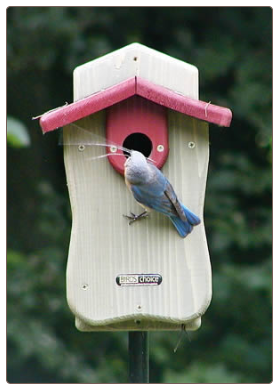 Called a Gilbertson Nest Box, it’s specifically designed for Eastern Bluebirds, but Tree Swallows and House Wrens are known to frequent them as well. Of the many modern materials now used for birdhouses… there is something to be said for old-fashioned wood. Especially the hand crafted wood birdhouses, the selection is fantastic (if you know where to look). Reclaimed materials like barn wood and tin make for some of the best (and sturdiest) houses for feathered friends, simply because they’ve already stood the test of time. The wood used on this log front wood birdhouse comes from a general store in the North Georgia mountains that’s over one hundred years old. Some hand carved wood birdhouses make for whimsical garden decor for us humans, while a swell dwelling for wild birds too. Many are totally functional with clean-outs and proper ventilation. Crafted from a fast-growth, renewable wood, this wood birdhouse below is a hoot! Providing birdhouses is a necessity for our avian amigos. Dwindling habitat, and competition from non-native birds for natural nest cavities, and of course predators, are just a few reasons we need to help wild birds thrive and flourish. Believe it or not… our own future depends on it. unique birdhouses… I’d say so! Artists are the ones who craft unique stuff because not only their talent, but their passion goes into the item. 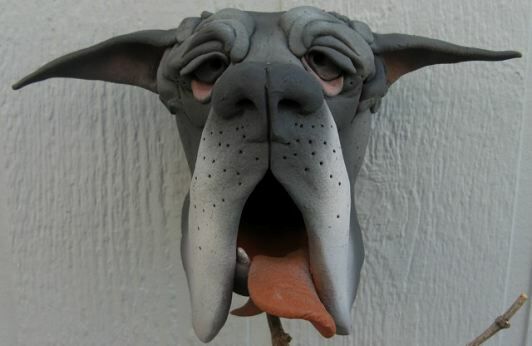 These unique birdhouses by artist Doug Fey are some of the coo lest I’ve ever seen! Totally hand crafted, no molds are used in his process. Twice fired, the process makes them weatherproof for year round use… perfect roosting spots for cold winter nights. 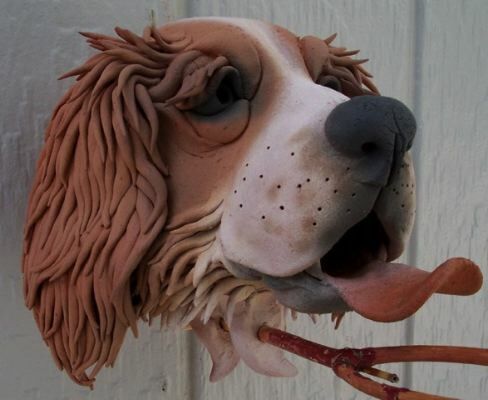 Not limited to clever canines, this artist has a wide variety of subject matter, and even welcomes custom work from photos of your favorite critter. Now ya must admit…these are some pretty unique birdhouses indeed!